I wanted to give you an update on my 2013 Shopping Ban while I save for something big. Well dear readers, I am both weak and strong. Weak because yes I have caved and bought two things. Strong because I have resisted plenty of other things! I got the leopard clutch from the fabulous Sheree at It’s Not That Deep, one of my favorite style blogs. She has a shop where you can buy some of the pieces she’s featured in her posts. The prices and selection are wonderful! I got this for $10. How could I say no? 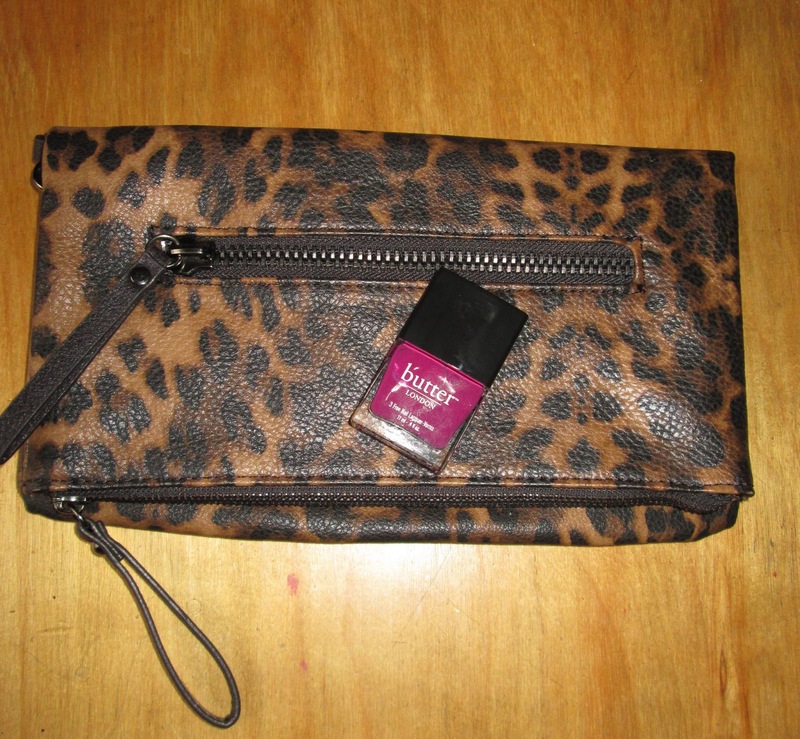 Leopard print clutch and butter London nail polish in Queen Vic. The nail polish is by butter LONDON, a brand I have been meaning to try for awhile. God knows I don’t need another bottle of nail polish, but I wanted to add a deep pink to my collection and this shade, Queen Vic, fits the bill perfectly. The formula is great, it goes on wonderfully, and has lasted awhile on my nails. Here are two things I did say no to. I tried on this Tory Burch top in December when I was working at Bloomingdale’s. 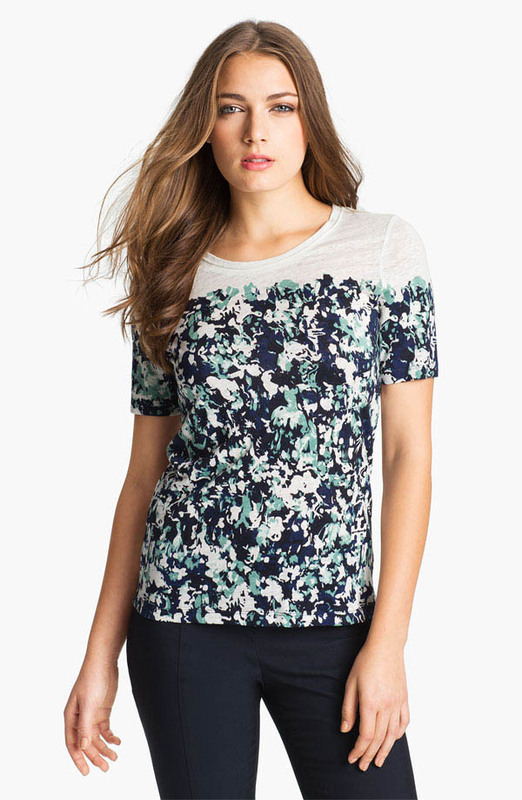 I think it would be great for spring. If it goes on sale this might find a home with me. This is a linen tee. Anybody have tips on cleaning linen? Ooh La La! 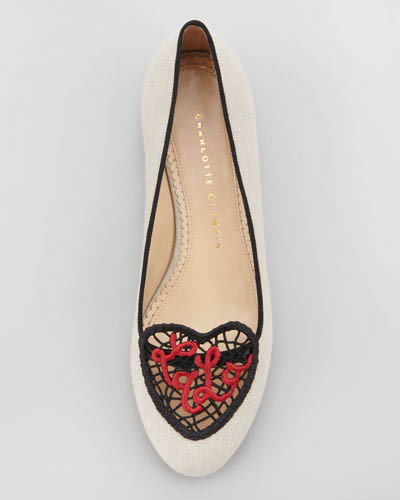 flats by Charlotte Olympia. These are linen too. What is it with me and linen lately? I love these Ooh La La! 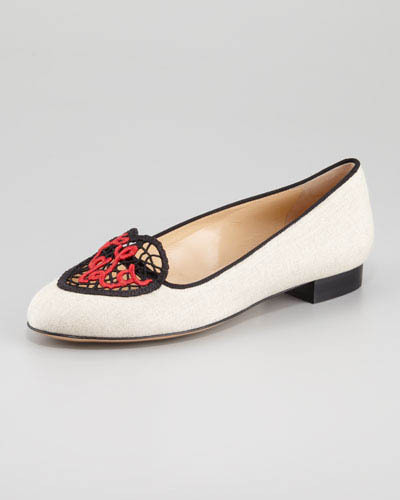 flats by Charlotte Olympia, but they are so expensive. I won’t buy them but let me dream dear readers, let me dream! I die of love whenever I see this shoe. Ooh La La is right! Have you been buying lately? Or resisting? Or both? Now I am dreaming about the shoes...oh my, lack of funds is such a pesky problem. Your clutch for ten...worth it!! have a great weekend ahead Jill! Oh my.....you have burned the image of those marvelous shoes in my head too...and I'm sure other's too. They are simply divine and very special. I'm on a shopping ban too...but I could be doing better with it. I'm not doing BAD with it; but still need to reign things in a bit. How is your son's dancing going? My son just started too! Great clutch and polish!! I love looking at other bloggers shop their closet stuff!! Plus, buying second-hand from an individual doesn't seem that bad to me lolzzz Linen is hard to keep clean for me because I'm such a mess-- sorry no tips! The polish is a great color. And those shoes? Amazing. Now I want them too! I can relate Jill! Been trying to resist buying anything this last month or so but bought anyway - but it has been a lot less then I usually spend - a rare triumph for me. Will be trying to keep it up. If it is any consolation I think the odd small inexpensive treat can keep the morale up in the face of flagging willpower and prevent more regrettably larger purchases! Lovely lovely lovely shoes !!! :) Wish I had them too !! So funny! I looked at that bag on Sheree's blog and was bummed that it was already sold. But now I am happy because one of my favorite people bought it! Love the polish with the leopard! Those shoes are darling! But they would get so dirty so fast, I would be afraid to wear them outside. 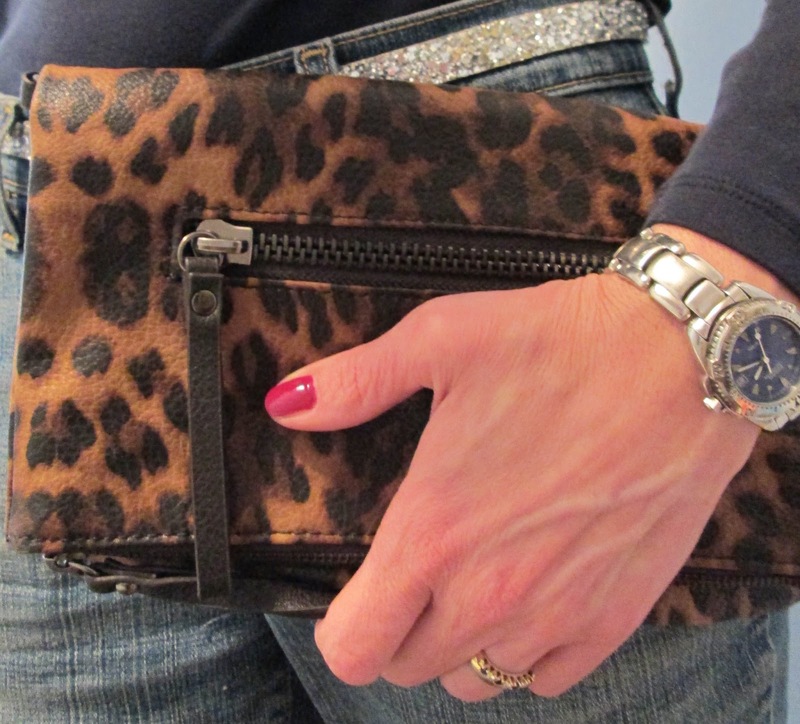 Your clutch is wonderful and the price even better! I've been resisting so much, more than I've ever done in recent times but caved in with shoes, I realised I have a shortage of low heels and flats - they don't come by easily in my size. I havent felt like buying because I am sick of winter. And I dont like to buy until I really figure out what I need for summer. I love the shoes however they are pricey and the colour may not be too practical for the less than clean London streets.